All fourteen major peacebuilding missions launched between 1989 and 1999 shared a common strategy for consolidating peace after internal conflicts: immediate democratization and marketization. This volume argues that transforming war-shattered states into market democracies is a basically sound idea, but that pushing the process too quickly can have damaging and destabilizing effects. A more sensible approach would first establish a system of domestic institutions capable of managing the disruptive effects of democratization and marketization, and only then phase in political and economic reforms as conditions warrant. Avoiding the problems that marred many peacebuilding missions in the 1990s will require longer-lasting, better-planned, and ultimately more intrusive forms of intervention in the domestic affairs of war-torn states. Roland Paris is Assistant Professor of Political Science and International Affairs at the University of Colorado at Boulder. He is an award-winning scholar and teacher, and a regular commentator on international affairs in national and local media. This book is in copyright. Subject to statutory exception and to the provisions of relevant collective licensing agreements, no reproduction of any part may take place without the written permission of Cambridge University Press. 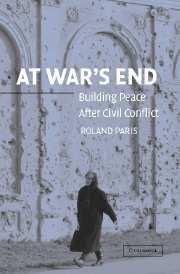 At war's end : building peace after civil conflict / Roland Paris. 1. Peace-building. 2. Democracy. 3. Capitalism. I. Title. Publication of this volume is supported in part by a grant from the Eugene M.Kayden Endowment through the Faculty Manuscript Award,University of Colorado at Boulder. Il est plus facile de faire la guerre que de faire la paix. This book examines every major peacebuilding mission launched between 1989 and 1999. There were fourteen in total; all were deployed to countries in which a civil war had just ended. Despite many differences, these missions shared a common strategy for consolidating peace after internal conflicts: immediate democratization and marketization. What can we learn from the peacebuilding record about the effectiveness of this strategy as a means of preventing the recurrence of fighting in postconflict situations? This volume argues that the idea of transforming war-shattered states into stable market democracies is basically sound, but that pushing this process too quickly can have damaging and destabilizing effects. Market democracy is not the miracle cure for internal conflict. On the contrary, the process of political and economic liberalization is inherently tumultuous: It can exacerbate social tensions and undermine the prospects for stable peace in the fragile conditions that typically exist in countries just emerging from civil war. A more sensible approach to postconflict peacebuilding would seek, first, to establish a system of domestic institutions that are capable of managing the destabilizing effects of democratization and marketization within peaceful bounds and, second, to phase in political and economic reforms slowly over time, as conditions warrant. To do this effectively, international peacebuilders will have to abandon the notion that war-shattered states can be hurriedly rehabilitated. One set of elections, without creating stable political and economic institutions, does not produce durable peace in most cases. Avoiding the problems that marred many peacebuilding operations in the 1990s will require longer-lasting and ultimately more intrusive forms of intervention in the domestic affairs of these states, because more gradual and controlled approaches to postconflict liberalization are more likely to achieve the central goal of peacebuilding: the establishment of a peace that endures long after the departure of the peacebuilders themselves. I developed this argument over several years. During this time, I was blessed with sharp-eyed and thoughtful colleagues and friends, many of whom offered their reactions to this project in its various stages of completion, and whose critiques prompted me to rethink and refine my analysis. They include Pamela Aall, Steven Brooks, Christopher Cavoli, Chester Crocker, Robert Dahl, Charles Hill, William Hitchcock, Alan James, Paul Kennedy, Jeffrey Kopstein, Ingrid Lehmann, Dan Lindley, Kimberly Zisk Marten, Mark Peceny, Kenneth Rodman, Bruce Russett, Jack Snyder, Steven John Stedman, James Sutterlin, Thomas Weiss, Alexander Wendt, and H. Bradford Westerfield. In addition, seven colleagues read and commented on the entire manuscript: Michael Barnett, Ian Cooper, Fen Osler Hampsen, Ian Hurd, Michael Ignatieff, Peter Viggo Jakobsen, and Michael Pugh. I thank all these people for their helpful criticism and advice, although I remain solely responsible for any errors of fact or interpretation. I gratefully acknowledge financial assistance from the Overbrook Foundation, the Academic Council on the United Nations System, Yale University, the Council on Research and Creative Work of the University of Colorado, the Fulbright Foundation, the Eugene M. Kayden Endowment, the Social Sciences and Humanities Research Council of Canada, and the Canadian Department of National Defence. This project would not have been completed without their generous support. In addition, I owe a debt of gratitude to the publishers and editors who allowed me to reproduce portions of previous works in which I tested out earlier renditions of my argument. Thanks in particular to Owen Coté, Sean Lynn-Jones, Michael Brown, and the MIT Press for permission to reproduce passages from Roland Paris, “Peacebuilding and the Limits of Liberal Internationalism,” International Security 22:2 (Fall 1997), pp. 54–89; to Chester A. Crocker, Fen Osler Hampson, Pamela Aall, and the United States Institute of Peace for permission to reproduce passages from Roland Paris, “Wilson’s Ghost: The Faulty Assumptions of Post-Conflict Peacebuilding,” in Turbulent Peace: The Challenges of Managing International Conflict (Washington, D.C.: United States Institute of Peace Press, 2001), pp. 765–784; and to Michael Pugh and Frank Cass Publishers for permission to reproduce passages from Roland Paris, “Peacebuilding in Central America: Reproducing the Sources of Conflict?” International Peacekeeping 9:4 (Winter 2002), pp. 39–68. Some of the ideas presented in these writings survived the criticism of colleagues and my own rethinking; many others did not. I would also like to thank Christopher Coleman of the United Nations Department of Peacekeeping Operations for allowing me to spend several weeks at UN headquarters; Elizabeth Olsen for research assistance on Guatemala; Richard Holbrooke for answering my queries about Bosnia; and the many Cambodians and foreigners in Phnom Penh who shared their thoughts about peacebuilding with me. Finally, several members of my family contributed to this project, both directly and indirectly. My mother, Erna Paris, an award-winning journalist and author, sparked my interest in politics and offered invaluable editorial advice on this book. Both she and my stepfather, Tom Robinson, gave me the privilege of growing up in a home that was full of books, discussion, and love – and, for that, I am deeply grateful. My sister and brother, Michelle Paris and Robert Paris, have been steadfast supporters throughout. My father, Jacques Paris, made two trips to a library in Montreal to track down the quotation from Georges Clemenceau that became the epigraph of this book.1 I thank him and my stepmother, Régine Guérin, for their affection and encouragement and not least for all the wonderful meals we have shared – and will share in the future. But my greatest appreciation goes to my wife and two children: Katie, Julia, and Simon Paris. Katie lived with this project from its inception, through highs and lows. Somehow, despite her own busy job of protecting wilderness and open spaces in Colorado, the arrival of Julia and Simon, and the tango of diaper changing and bottle filling that we have happily danced for the last three years, Katie found the time to pore through this volume in its many drafts, and I benefited immensely from her editorial talents. For her love and friendship, the book is dedicated to her.